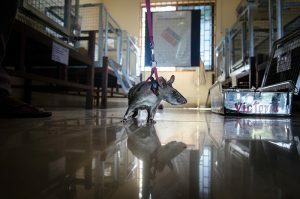 Cambodia is still one of the most landmine-affected countries in the world. Over 64,000 landmine and other explosive remnants of war (ERW) casualties have been recorded in Cambodia since 1979. With over 25,000 amputees, Cambodia has the highest ratio of mine amputees per capita in the world. A recent baseline survey of 12 districts revealed that 1,914,818 m2 of land surface is contaminated by landmines and ERW. In addition, at least 26 million explosive submunitions were dropped on Cambodia during the Vietnam war, mostly in Eastern and North-Eastern areas bordering the Lao people’s democratic republic and Vietnam. The bombing is estimated to have left between 1.9 million and 5.8 million cluster munitions remnants. Belgian NGO Apopo, who have been training African giant poached rats in Tanzania, Angola and Mozambique to detect explosives and tuberculosis, invited me to document their training process as 3 mine detection rat (MDR) handlers drafted from Africa, taught a cmac demining platoon how to locate landmines and uxo using african giant poached rats. The demining project between CMAC and Apopo will be targeting 6 northwestern districts close to the infamous “K5 belt”.